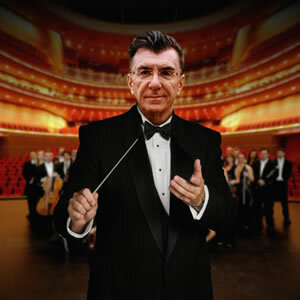 Prof. Giuseppe Savazzi, conductor, musician, writer, music director of the Rotary Youth International Orchestra from 1987 to 2017. He began studying music at the age of six, attending the “Giuseppe Verdi” Conservatory in Milan, where he attained an honours diploma in Tuba in 1974, under the guide of Bruno Ferrari, and in Piano in 1975, under Ilonka Deckers Kussler. He continued his musical studies, completing with the course in Composition taught by Irlando Danieli. From 1979 to 2001 he occupied the role of First Tuba in the orchestra of the Teatro Regio di Torino, after working with numerous musical institutions such as the Teatro Alla Scala in Milan, Teatro San Carlo in Naples, the Arena of Verona, the RAI in Milan, the Chamber Orchestra of Europe and Jeunesse Musicale. He was the first Italian to win a Rotary International Foundation Music scholarship. Between September 1987 and June 1988, he perfected his studies at the Northwestern University (Evanston, Illinois, USA), where he attained a Master in Orchestra Direction and in Tuba, studying with Frederich Ockwell, Victor Yampolsky and Arnold Jacobs. During this period of time he had the opportunity to study under Sir George Solti at the Chicago Symphony Orchestra and to direct the Chicago Municipal Orchestra and the Illinois Symphony Orchestra. He subsequently attained a Diploma in Orchestra Direction at the Accademia Chigiana, under the guide of Ghennadi Rozhdestvensky. 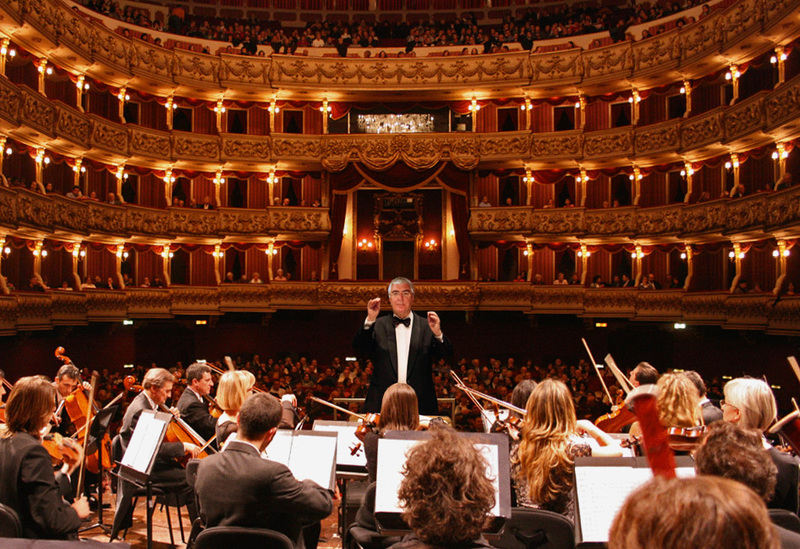 In 1989-90 he organised the foundation of the Rotary International Orchestra. With sponsorship by Lufthansa, he directed this youth orchestra during a long European tour. He worked with soloists of international fame, such as Paul Badura-Skoda and Philippe Bianconi, whom he directed in numerous concerts. In 1992 he was assistant to Maestro Sergiu Celibidache at the München Philharmonic Orchestra. In 1995 he took part in the First World Music Festival in India, directing the Universal Symphony Orchestra. He directed the same Orchestra in 1996 and, in Assisi, in 1998. In 2002-2003 he attended a course at the Musikhochschule of Vienna as a post-graduate student, upon invitation by Prof. Leopold Hager. In 2004 he attended the “Managerial training Programme” at the Industrial Union of Turin. In 2005 he directed the Universal Symphony Orchestra. He currently cooperates with the Teatro Regio di Torino Turin, the Wiener Philarmoniker, the Israel Philharmonic Orchestra, the Tel Aviv Symphony Orchestra and the Chicago Symphony Orchestra. 1990-2017 Rotary Youth International Orchestra. Rtn. 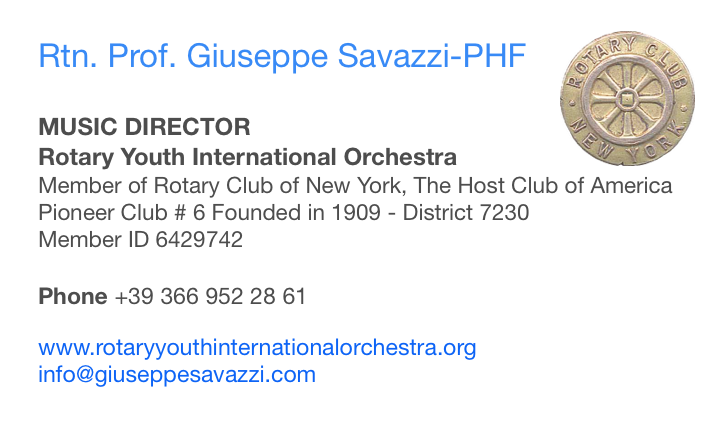 Prof. Giuseppe Savazzi-PHF is an Ambassadorial Scholarship alumnus who excelled himself in organizing the Rotary Youth International Orchestra and has been a Rotarian for 30 years. He was the first Italian to be awarded a Rotary scholarship to study music. In Rotary year 1991, to commemorate the 75th anniversary of the Rotary Foundation he was designed one of seventy-five Foundation candles symbolizing all those people and projects that have illuminated people’s lives during the foundation’s first 75 years of Service. An Ambassadorial Scholar sponsored by the Rotary Club of Torino-Nord (Italy – Rotary International District 2030) to study Masters Degree at Northwestern University in Evanston (Illinois, USA) is ambition of organizing a Rotary Youth Orchestra to foster friendship among young musicians around the world fulfilled when he led the 90-member group from 15 countries to perform fundraising tours in Europe in the 1990s. His Membership classification is “Music Director”.